A couple of weeks go I wrote an op-ed about a proposal in Connecticut to create a new tax-preferred retirement plan that would, by default, include almost all workers who don’t currently have access to an employment-based plan (like a 401(k)). That proposal took some major steps forward when it was included in an end-of-session bill that was passed by the Connecticut legislature. As it stands, the bill authorizes a feasibility study and implementation plan for the new retirement option, which must contain a number of features (default enrollment, portability, default annuitization at retirement, a guaranteed return to be specified at the beginning of each year, etc.). As I said in the op-ed, this is a decent step forward that will increase the amount of retirement saving by low- and middle-income workers, put those savings in a relatively low-cost, low-risk investment option, and spread some of the benefits of the retirement tax break to those workers (although you do have to pay income tax to benefit from the deduction). One of the claims made by the plan’s opponents is that it cannot be managed for less than the 1 percent of assets mandated by the bill, but that seems laughable to me: the State of Connecticut’s current retirement plans for its employees have administrative costs of 10 basis points, plus investment expense ratios as low as 2 basis points (for index funds from Vanguard). This is a slightly different animal, since the idea is to invest in low-risk securities and buy downside insurance, but still it doesn’t follow that you have to pay more than 1 percent for asset management is. Connecticut is one of several states, most famously California, that are in the process of implementing these public retirement plans to cover people who are left out by the current “system,” which favors people who work for large companies. They can solve several of the common problems with 401(k) plans: nonexistence (at many employers), low participation rates, investment risk, pre-retirement withdrawals, lump-sum distributions at retirement, to name a few. But they can’t solve the underlying problem, which is that many people just don’t make enough for saving 3 percent of their salary each year to make much of a difference. A big constraint is that the Connecticut plan was designed to not cost taxpayers any money: administrative fees will come out of plan balances, and the insurance is there to limit the chance that the state will have to bail out the plan in the future. If we really want to protect people against retirement risk, we need to actually spread risk by making either the funding mechanism or the benefit formula progressive, which means we can’t regard the idea of the untouchable individual account as sacrosanct. (See my recent paper for more on this topic.) That’s what Social Security does, and it’s vastly popular. But in today’s political environment of me me me me me, and so we’re stuck with treating symptoms. 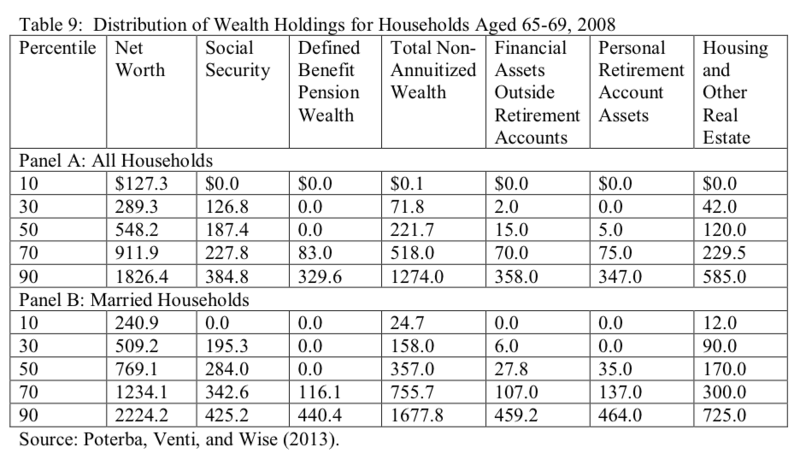 James Poterba wrote up a very useful overview of the retirement security challenge in a new NBER white paper. (I think it’s not paywalled, but I’m not sure.) He provides overviews of much of the recent research and data on life expectancies, macroeconomic implications of a changing age structure, income and assets of people at or near retirement, and shifts in types of retirement assets. It seems obvious. Yet it’s often lost, both by the scolds who lecture Americans for not saving enough and by the self-appointed personal finance gurus who claim that anyone can become rich simply ye saving more (and following their dodgy investment advice). Saving is sometimes seen as some kind of moral virtue, but from another perspective it’s just the ultimate consumption good: saving now buys you a sense of security, insurance against misfortune, and free time in the future, which are all things that ordinary people don’t have enough of. Real Time Economics (WSJ) links to a new survey being pushed by America Saves (which appears to be a marketing campaign run by the Consumer Federation of America, which seems not to be evil*). According to the survey, there are significant differences in savings rates and accumulated savings between lower-middle- and middle-income households. And that’s treating all households in the same income bracket as being alike, leaving aside differences in family structure, cost of living, etc. I’m all for living within your means and saving for retirement and all that. But it’s a myth to say, as America Saves does on its home page, “Once you start saving, it gets easier and easier and before you know it, you’re on your way to making your dreams a reality.” The underlying problems are stagnant real incomes for most people, rising costs (in real terms) for education and health care, increasing financial risk due to the withdrawal of the safety net, and increased longevity (good in some ways, but bad if incomes aren’t rising and you want to retire at 65). That’s why households are showing up at age 64 with less in retirement savings than they had just last decade. And why, if you feel like you’re not saving enough, it’s probably not your fault. * But America Saves itself is supported by a bunch of financial institutions and trade associations like the Investment Company Institute, which have a vested interest in getting people to entrust more money to them. Floyd Norris says some sensible things in his column from last week on the retirement savings problem: Defined benefit pensions are dying out, killed by tighter accounting rules and the stock market crashes of the 2000s. Many Americans have no retirement savings plan (other than Social Security). 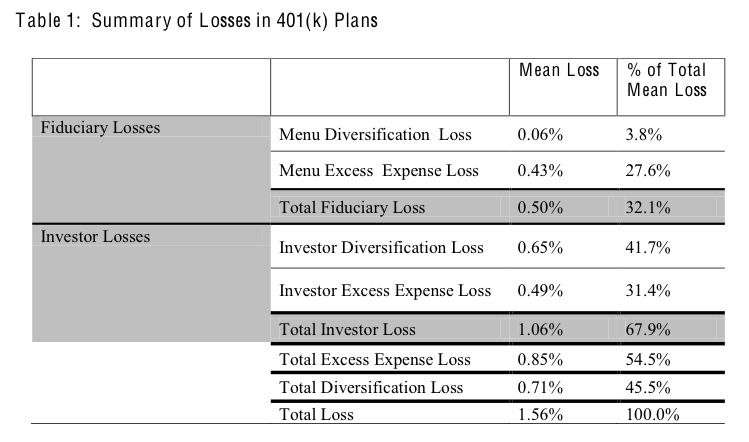 And the plans that they do have tend to be 401(k) plans that impose fees, market risk, and usually a whole host of other risks on participants. But even his cautious optimism about some new policy proposals is too optimistic. One is the MyRA announced by President Obama a couple of weeks ago. This is basically a government-administered, no-fee Roth IRA that is invested in a basket of Treasury notes and bonds, effectively providing low returns at close to zero risk. The other is a proposal by Senator Tom Harkin to create privately-managed, multi-employer pension plans that employers could opt into. The multi-employer structure would reduce the risk that employees would lose their pension benefits if their employer went bankrupt.